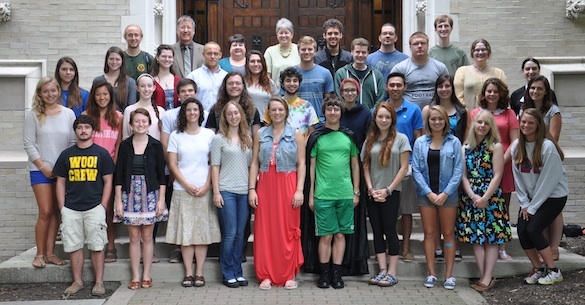 What a fine group of geologists we had at the first meeting of the College of Wooster Geology Club this week. We have an ambitious year ahead of us with outside speakers, student presentations, course field trips, and our biennial Mojave Desert Spring Expedition. Our number of geology majors has grown significantly as well, which is delightful for the faculty and staff. This great photo was taken by our departmental chair, Greg Wiles. Too bad he couldn’t have been in his own expertly composed image. Links to our course offerings this semester can be found on our Geology Department Courses page.